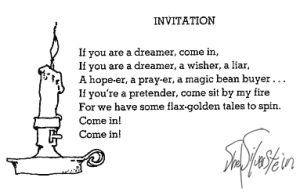 HAPPY BIRTHDAY SHEL SILVERSTEIN. THE WORLD IS THANKFUL FOR YOUR WIT AND WISDOM. I only know him through his songs for Dr Hook, but am going to explore his writing now! I love James Thurber and Shel seems a kindred spirit. You will enjoy him. Did you know he wrote A Boy Named Sue? Gosh—I used to read The End of the Sidewalk almost every year—he has such a gift!! His work is an absolute treasure! I think that his him at his most serious. He had so many different talents.. poet, song writer, author. I always loved his wicked sense of humor.